Just back from ten days in New York City – where he met with producers of the New York Times' "The Daily", as well as with young filmmakers of a film he is scoring – Ben Landsverk, American composer, singer, and multi-instrumentalist, sat down at Woodstock Wine & Deli for a conversation with THE BEE. Landsverk, and Jim Brunberg of the band "Wonderly Music", have scored the introduction and ending of the NY Times' "The Daily" podcast and twenty-minute weekday news program that began in 2017. The duo has also scored music for a number of films. Landsverk, 41, is very much a presence on the local and national music scene; but if you haven't listened to "The Daily" on podcast or on Oregon Public Broadcasting radio, or if you aren't a music enthusiast, you may not have heard of him. Raised in Eastmoreland, Landsverk's musical career began early, and was nurtured by music teachers who recognized a focus and talent that was out of the ordinary. 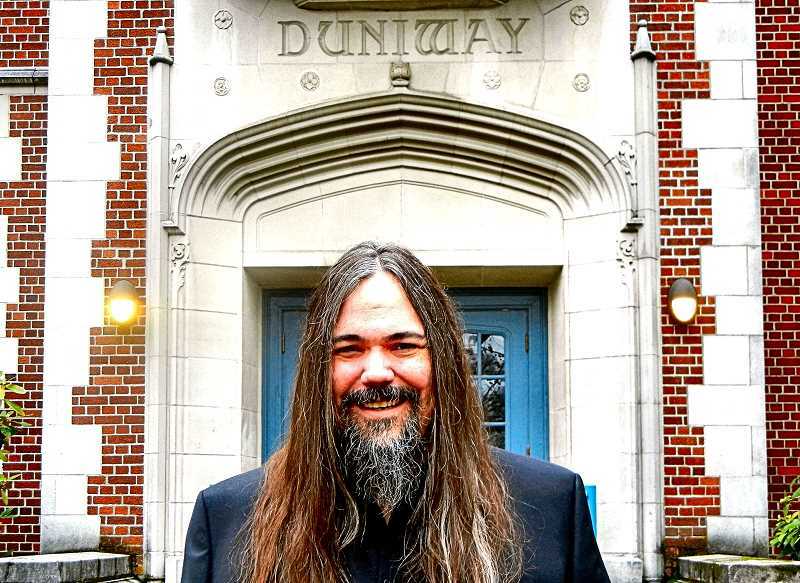 At Duniway Elementary School in the 1980s, Landsverk remembers David Stone – Sellwood resident, trombonist, and music teacher – as an inspiration. "He brought the joy and accessibility of music to me when I was six or seven years old. A very memorable moment was when on the first day of class, he gave each of us a stone." Those years of elementary music instruction complemented Landsverk's home experience of hearing music since birth, and sitting next to his mother while she played piano, and listening to his father play trombone. His brothers Joe and John learned to play bassoon and euphonium, respectively – while Landsverk was transitioning from violin to viola at age thirteen, and playing in the Portland Youth Philharmonic. Landsverk is humble about his evolution into a nationally-recognized musician, and says no one ever told him to pursue it professionally, or to feel like he was a virtuoso. He claims it has been the lucky assistance from exceptional musicians that helped launch him to where he is. "I am not sure how, but I was very lucky to have a couple of conducting lessons from James DePriest [the late conductor of the Oregon Symphony] when I was fourteen. He was such a force of nature, and gave me some incredible pointers on how to conduct. He did a lot to inspire my love of conducting." "I was just back from Tanglewood, and the opportunity was there. The Oregon Symphony sent Murry Sidlin – the resident conductor of the symphony – to Wilson High, to give conducting lessons." Landsverk says it was a challenge to be a student conducting students, but it was an experience that gave him insights into orchestral group dynamics. "I remember thinking, 'I'm responsible for all of these players!'" At Yale University, he studied composition and music theory. On returning to Portland, he did composing and conducting for the choir of Trinity Cathedral, and later for St. David of Wales Episcopal Church in Southeast Portland. He also continues to direct "Voices Unlimited", Portland's flagship choir which serves adults with developmental disabilities. To earn a living and to express his passion for composing, Landsverk and Jim Brunberg work with their band "Wonderly" to score music for films. While in New York recently, they were working on director James Westby's upcoming film "At The Video Store", which Landsverk describes as "a lament to the disappearance of local video stores." Landsverk and Brunberg have worked with filmmakers Gus Van Sant and John Waters to score films, and are currently composing podcasts as well as an LP record on folklore and mysteries of the Northwest – focusing on never-caught airplane hijacker D.B. Cooper, whom Landsverk describes as part of the mythology of the Pacific Northwest. The most recent passionate expression of his support for creating community and joy through music is his conducting of the newly founded "OK Chorale PDX", which is a drop-in, non-audition chorus of people over 21 years of age who love to sing and want to learn harmony and sing together twice a month. Landsverk says "OK Chorale" is the inspiration of Kate Sokoloff, the founder of "Live Wire Radio", a public radio variety show launched in Portland in 2004. To add to his seemingly inexhaustible energetic creations of music is Landsverk's involvement with Kasey Anderson's band, "Hawks and Doves", which was recently written up in Rolling Stone. When you put all of his projects together, it seems Landsverk himself might be described as a force of nature.